Tropical drink recipes are naturally refreshing, since they blend exotic fruit with crisp spirits. 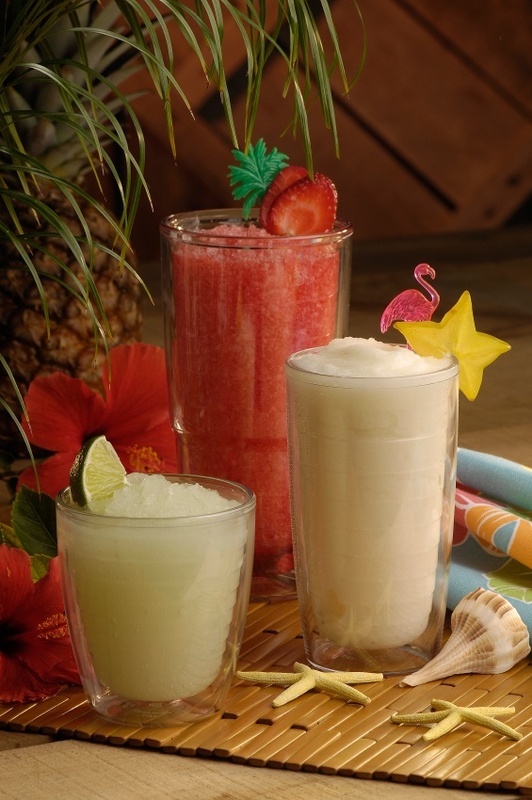 Some tropical cocktails are ideal served as frozen drinks while others can be served over ice. A sampling of popular island cocktails follows. Mix the tequila and orange juice together and pour them into a glass filled with ice. Slowly pour grenadine into the glass, allowing it to sink to the bottom. Pour all the ingredients except the dark rum into a shaker filled with ice. Shake and pour the contents into a glass. Then add the dark rum on the top. Garnish the drink with slices of lime and orange. Pour the ingredients into a shaker with ice. Shake well and pour the beverage into a cocktail glass. Garnish with a maraschino cherry and a slice of lime. Filler a shaker with ice and add lime juice, followed by the remaining ingredients. Shake well and pour the drink into a hurricane glass. Garnish it with an orange peel and a maraschino cherry. Mix the ingredients together and serve the drink in a cocktail glass filled with ice. Garnish it with a slice of lime. Blend the ingredients with ice until smooth. Serve the drink in a chilled hurricane glass and it garnish with a wedge of pineapple and a maraschino cherry. Want to see another pina colada recipe?